Okay, the wall still has a gaping hole. But the housing inspector we had come in to look at it thinks it's not as big a repair job as we feared. 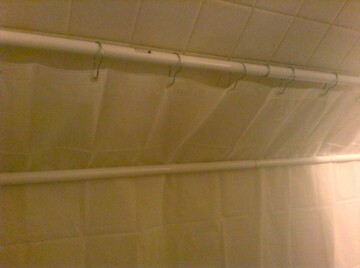 And he had a nifty idea for a jury-rigged solution that will let us use the shower stall until we can get it repaired. We bought two tension rods and a shower curtain liner. 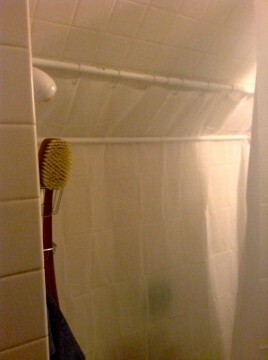 The first tension rod goes above the height of the shower head, and the second goes a little lower down, flush against the wall. We tuck the new liner behind that second rod. It took a trip to Menard's and about ten or fifteen minutes to install. I CAN TAKE A SHOWER!!! You have no idea how exciting this is. Particularly happy to have this solution now that chemo starts again tomorrow. I have been holding up pretty well, all things considered. But I need to post one paragraph of self-pity. Tonight, Delia was taking a shower and suddenly yelped in alarm. Some tiles in the shower had suddenly tumbled out of the wall onto her legs. The wall behind is water-logged, rotted and moldy. I'm afraid to find out how extensive the damage is, but it's undoubtedly the reason why the ceiling in the kitchen right below has been cracking and showing water stains. We've been ignoring the problem up until now because we didn't really have the money to repair it. Now we have no choice. We won't have a shower until it's fixed (we only have the one bathroom) and Rob can't be exposed to the mold. I'm afraid when they tear the tile and probably the wall out, we may have to tear out the kitchen ceiling, too. Dammit. I don't NEED this. I don't need to deal with the mess and the hassle and the expense and--argh. Okay, that was two paragraphs. Chemo starts a week from today tomorrow. "Hmm. This one drug in my chemo regime is the same chemical they use in mustard gas." "Any...effluvia from me for 48 hours after treatment--vomit, diarrhea, and so on--apparently should be treated sort of like toxic waste. Handle soiled clothing or bed linens with rubber gloves and keep away from other laundry. Wash twice. Close the lid of the toilet when flushing, and flush twice. Anything wiped up has to be handled in separate trash." Then there's the list of symptoms. Gulp. Plus, apparently we have to go do a lot of shopping. I hope to get the CaringBridge Support Team set up sometime in the next week. I spent the weekend doing a bunch of batch cooking. I now have ziplock bags filled with tomato sauce, shredded roasted chicken, cooked rice, roasted peppers, and cooked butternut squash, all stuffed into the freezer. I still have a couple of pork shoulders to be roasted and shredded into pulled pork. I also cleaned up around my bedroom and got a lot of the tax paperwork off the floor. My to-do app, Carrot, is very pleased with me and has rewarded me by giving me a virtual kitten. It suggested I name the kitten Captain Whiskers. I went into work. And then my body said, "Uh, no." I had cut the pain medication just a touch too early. So I came home and spent a quiet day at home puttering about doing simple, small tasks which have been put off for far too long. I cleaned up a corner of my bedroom; it was absurd how happy this made me to see three feet of clear space. I shredded a bunch of old checks for some bank accounts that have been closed, since I moved to a credit union. Not much stamina still. I'll be going to bed early tonight. The living room has been taken over, literally, by all of Fiona's possessions from college. They cover all the seating in there. The dining room table is overflowing with newspapers and other debris. My (former) office is now Fiona's bedroom and thus no longer available. That leaves my bedroom. And Rob is stretched out full length on the bed for a nap, and the girls are curled up on the other side. There's the chair in my computer nook. Not good for curling up with a book. Or the bathtub. That's it. The light fixture over our dining room has been giving us trouble for months. We'd flip the switch and the lights would flash on and then off. We replaced the bulbs, and even brand new bulbs would do this. If we flipped the switch several times, eventually they'd come on and stay on. The light fixture has five bulbs in it. Over the past few months, the number of bulbs that would come on even after repeated flicking of the switch dropped from four to three to two. Finally, last week, there were mornings when it refused to turn on entirely. It's December. In Minnesota. I cannot read my newspaper in the dark. Enough was enough. We know the wiring in our house is very old and problematic, but we've never had enough money to deal with it. We still don't have the money to deal with it, but this was ridiculous. So I called around to the neighbors to ask for a reference for an electrician, and one of them suggested that I call our neighbor across the alley. "He just had a bunch of remodeling done." When I called John, he offered instead to stop by at my house to look at the fixture himself. He had a tool that would check for wiring problems. This was surprising, but highly gratifying, and of course I said yes. When he stopped by tonight and used his handy gizmo, he quickly determined that yes, power was getting to the switch, and going through the wires coming from the ceiling. He squinted up at the light and said diffidently, "Do you by any chance have any incandescent light bulbs?" I blinked, surprised. We had been using compact fluorescent lights. I found a couple in the closet, so I took them out, swapped out the bulbs, and voila. Let there be light! Huzzah. I don't have to pay for an electrician to come to redo the wiring in my dining room. Don't you love it when you're worrying about a big repair bill that instead turns out to be an easy fix? Fiona graduated last Friday, and we had our open house on Sunday. The graduate and her family (Delia, me and my parents)! I worked yesterday and then had to drive to one of the dojos to take pictures of a belt exam. Had dinner out afterwards. When I got home, I had the wonderful discovery that the girls spent yesterday cleaning up the downstairs (with the additional help of my sister and my mom) and got the Christmas decorations out. Lordy, what a relief and a pleasure to come home to find a house that doesn't make me cringe when I walk inside. The cough is still present, and I had some difficulties with coughing jags, but they are coming a little less frequently at least. I hope everyone has a marvelous thanksgiving. I am particularly thankful that we've made it this far on one job and for a loving and supportive family. I filed much financial paperwork. I caught up on my financial bookkeeping. I hectored Fiona into signing up for Fastweb. I did laundry. I tried a new nutritious recipe so breakfast for the girls tomorrow is ready and waiting for them. I walked to the hardware store to get hardware to allow me to hang the new Moroccan lanterns on the porch (they look lovely). I downloaded the karate belt test pictures for two dojos, cropped them, and got them off to the webmaster. I updated the names of the kids who passed this month's test. I cleaned part of the living room, discarding outdated mail. I updated my address book. I went out for coffee with Mom. I got painting supplies so we could get the last painting job finished (the trim on the garage). I bought new drinking tumblers. I gave the girls backrubs. I did dishes. I read fun, mindless books. I gave myself a manicure and pedicure. Okay, I didn't do slow kicks. Shut up. Don't judge me. Still, I'm really happy with all that I got accomplished this weekend. "Dad fixed the silverware drawer. I think this is a sign of the apocalypse." My husband is actually fixing the silverware drawer. It has been broken for, I believe, roughly ten years. Burglaries in that area of south Minneapolis are up 47 percent from this time last year, and authorities have few explanations for the increase. Among the 1920s bungalows of the Police Department's Third Precinct in south Minneapolis, burglaries the first six months of this year are up 47 percent over the same period last year. Kicking in doors, tearing out screens and reaching through open windows, burglars have invaded hundreds of the precinct's homes. The burglary surge has not occurred everywhere in the city. Three other precincts have had a drop in burglaries so far this year. The only other place where break-ins are on the rise is the First Precinct, which recorded a 22 percent increase so far. Citywide, burglaries are up 1.5 percent for the first six months of the year, from 1,967 last year to 1,996 this year. However, burglaries are down 7 percent citywide from two years ago, when Minneapolis saw 2,155 burglaries in the first six months. No one seems to have a good explanation for this year's epidemic in the Third, which is bounded by Interstate 35W on the west, I-94 on the north, the Mississippi River on the east and 62nd Street on the south. "It's been a huge increase," said Sgt. Joel Sandberg, one of the detectives charged with finding the burglars. He sounded weary in a recent interview as he talked about how many cases have landed on his desk recently. According to Sandberg, some of the jobs have been pulled by known criminals -- career offenders who can singlehandedly create a mini crime wave. Others are first-timers driven to steal after losing a job. More at the link up above. The article doesn't mention muggings. But I have a hunch they're up, too. Delia's agitation to finish the Room Rearrangement of Doom reached fusion this weekend. Fiona's bed has finally been moved to my old office her new bedroom, which seems to be a critical tipping point, touching off a cascade of other displacements. There is a dresser in the hallway, boxes of books on my bed, and an armchair on the landing of the stairs, necessitating clambering over it anytime anyone wants to go upstairs or downstairs. Despite my shrill remonstrances, two bookshelves are remaining in my old office Fiona's bedroom. The rearrangement of furniture that Fiona decided upon, necessitated by the placement of the heat register and the closet, makes absolutely no sense to me, none. It is physically painful for me to even look at it. I mean, that bookcase Just. Does. Not. Fit. In. There and it is absurd to have two bookcases sitting smack in the middle of the room. I have been overruled and have retreated to my closet my office nook to lick my wounds in defeat. I wonder if we will all be still speaking to each other by the time the weekend is over. I have to make dinner. I have zero incentive to do so, considering 1) the girls already made pasta for themselves and ate it and 2) the stove is still covered with dirty pots and pans even though Rob did a drainer of dishes. I just can't bear to cook in a dirty kitchen and don't see the point when they won't eat what I make anyway. I really am crabby. I think I should simply go out and eat by myself. I think I may get some doublestick tape and tape up art cards on the slanted ceiling of my office nook. I need something to cheer me up. I also found my book cover plates, finally, and I may see about getting them mounted to put on the wall. Maybe hang up a string of fairy lights, too. Maybe. This has been the most astonishing, flat out incredible weekend EVER! Everyone, please look at this blog that my family put together about the amazing blow out surprise they cooked up for me for my 50th birthday. I'm still just reeling in shock. Thank you, thank you everyone. I will post a follow up message to give more of my reaction so that it can be posted at the blog, too, but I just wanted first to get this link up so that more people can know all the hard work my family did to give me a surprise that topped anything I've experienced in my life, ever. Lots of pictures are posted there for you to see. You'll have to scroll through several pages to see everything that they had planned. I've been totting up our financial paperwork in preparation for doing our taxes (we got them done early, yay) and because we had decided to refinance. I won't bore you with the details, but our purpose is to roll the main mortgage and the home equity line of credit we have outstanding into one loan and get some cash out. The home equity line of credit we've just been paying interest on, really, mostly, but it's a ten year loan coming due next year and we couldn't pay the whole thing off, and it's been hanging over our heads making me nervous like the Sword of Damocles. Now that will be eliminated. We are using the cash out to get the money to paint the house (the city insists) and to have something to tide us over until some job for Rob finally materializes for us in this jobless recovery. HUGE relief: we got approved for the loan, although we haven't yet locked the rate (wish I had yesterday. The monthly mortgage payment floated up $50 dollars a month today. I HOPE it goes back down). Well, I got approved, that is--this loan is against my credit only. Rob's is pretty much shot. We will be taking out a thirty year loan, which sounds crazy, I know, but we plan to prepay principal, hopefully so that we can get it finished in fifteen to twenty years, so it'll be finished up right when I'm ready to retire--barring any future financial disaster, that is. I hate stripping some of our equity, but there's no doubt it'll get us through this tough period. So. We're going to get a chunk of cash that will keep us going for quite a while longer. Between that and the tax refund, I'm going to be able to breathe a little easier than I've been able to do for a long, long time. And I want to thank you for that: this community. The money that you raised and gave us a year ago has tided us over to this point, and now we're going to be able to keep going. That is amazing. That is just fantastic. Rob will have been out of work, as of June 1, for two years. And yeah, things have been really tight, and I haven't been above bitching about it, but we still haven't paid a single bill late. How many people can say that? Not very many. I truly feel blessed. The girls are back home (yay! ), and we're back from Minicon weekend. Rob has been quite busy all week with this temporary census job. It has prevented him from putting any work in on the room rearrangement project--and since it's to a large extent his stuff that's the bottleneck, I was stymied from doing it myself. But we got started finally on Friday morning. Two bookcases and a dresser have been moved so far, so we're partway there. My computer is still in the room that's going to be Fiona's bedroom, at least until we figure out wiring. Rob may resort to running cables rather than depending on a wireless card. Not sure. We'll see. I hope we'll be able to work on it during the coming week, although I think he has more census work in the way. The two of us headed to Minicon on Friday afternoon. (Didn't stay at the hotel this time, but drove home in the evenings.) The con is quite small now, just about 400 people now (quite a change from the days when 3000 used to show up). I did no programing this year, and mostly just sat around and talked with people. That was nice. The girls got back late Saturday afternoon and came straight to the hotel. They had a marvelous time. Delia ran quickly through her pictures on the digital camera, showing me the people and scenes from the past week. They were rather tired, and Fiona's fighting a cold. We didn't stay late Saturday, and we left right after the con was finished today. So: the girls are safe and well and home, the con was subdued, but quite pleasant, and I have a beautiful new deck. Life is good. I figured it out this weekend. Take Rob's huge collection of T-shirts out of the smaller closet by my side of the bed in our bedroom (New Office) and put them...um...somewhere. I've already emptied out the dresser in there of my things, discarding some of the contents and squeezing the rest into two other dressers in our bedroom. I'll try to convince him to cull the collection, but he bought many of them at science fiction conventions and so considers them souvenirs, which means he must hold onto them until he dies. And then he'll expect his heirs to hold onto them forever, too. Convincing him will be very uphill work. The argument that he doesn't need fifty to sixty T-shirts will probably fall upon deaf ears. Take dresser out of New Office and put it into the closet of Old Office/Fiona's bedroom. It will now be her clothing dresser. Her old dresser will remain in the old bedroom, now Delia's room. We don't have room to move her old dresser from her old bedroom into the New Bedroom with the desk there. Take low green bookcase out of girls bedroom/Delia's room and put it into New Office. Fill it with books from my office, bookcases 1 and 2 and 3. Take bookcase 1 out of Old Office and put it into Delia's room where the low green bookcase used to be. Move arm chair out of Old Office into Delia's room. Take Fiona's bed out of the girls old bedroom/Delia's Room and put in her new bedroom/Old office. Move bookcase 2 to a different position so that it's flush up against the bed. Fiona puts her books into bookcase 2 and 3, as well as leaving some in her old bedroom. The only things I'll have to buy: a shelf for putting my computer on in the New Office, a chair, and a light source/lamp.